With horse slaughter remaining a hot topic in the equine welfare community, many horsemen are seeking a way to keep their horses from that fate when they no longer own them or if they are lost or stolen. Microchipping would appear to be the logical solution. But despite what you read on the Internet, no government regulation requires livestock auctions or kill buyers to scan for a chip. One equine website that peddles microchips claims that in 1996 the U. S. Department of Agriculture (USDA) sent it a policy letter stating it was “illegal to process an agricultural animal (an equine) for human or animal consumption if that animal has had a microchip embedded.” The USDA denies ever having such a policy, and Dr. Janine Jacques, founder of the Equine Rescue Network, said she has little hope the current administration will adopt such a regulation. For now, Jacques said the biggest effort should be to get owners to microchip their horses and register them in a database maintained by their breed registry or a commercial microchip registry. Currently about one million horses are microchipped, but this is a small percentage. An assistant professor at the New England College of Business, Jacques has a PhD in computer science. She is eager to develop a smartphone app that will help reunite horses and owners via microchip identification. But first this will require the cooperation of millions of horsemen who haven't yet microchipped their horses. Meanwhile, Jacques and other activists are coordinating efforts with registries to open their microchip databases to a central search engine that will simplify and speed up the process. Currently, the Equine Rescue Network, a web of more than 226,000 volunteers, scans horses in “kill pens” along the slaughter pipeline to Mexico and Canada to find microchips, most times with just hours to make the connection with the contact listed for the horse before it enters the sale ring. It's a complex race against time. A scanner displays only the number of the microchip, not the contact information associated with it. So the volunteer must track the number to the manufacturer, then to the registry to which it was sold. The registry then looks up the chip in its database to obtain the contact information for ERN. Finally, the ERN volunteer attempts to notify the contact to ask what he or she wants to do with regard to the horse. ERN is just one of many organizations that try to reunite these horses with their listed contacts. Dr. John Wade, who founded Microchip ID Equine in 1989, developed the Equine Microchip Lookup Tool to aid ERN and others in their search. His company also maintains the Equine Protection Registry, where owners can register their microchips in a central database, no matter what company or registry supplied them. The service operates a 24/7 hotline to reunite owners with horses. In addition to identifying horses in kill pens, the Equine Protection Registry helps locate lost or stolen horses and ones found after disasters, sometimes giving closure to owners whose horses are found dead. It even provided vital documentation to reunite an expensive sport horse in California with its rightful owner after an ownership dispute. A lifetime listing with the Equine Protection Registry costs a one-time fee of $22.95 per horse. Microchips purchased from Microchip ID Equine receive a free lifetime listing. While breed registries, such as the Jockey Club, maintain microchip identification free of charge, people with unregistered (crossbreed) horses must go elsewhere for microchips, such as companies that primarily supply microchips for pets. These companies require a yearly fee of around $25 to maintain the microchip information in a database. 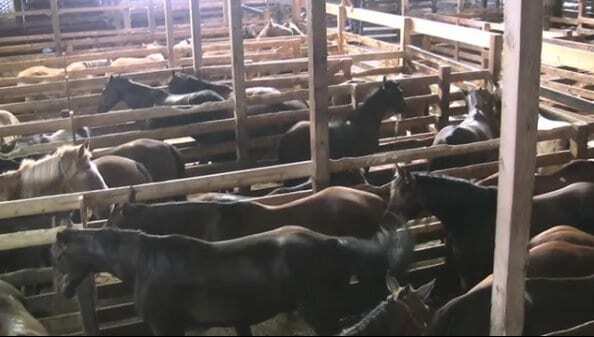 Jacques said livestock auctions readily allow volunteers to scan horses for microchips, and they cooperate with ERN because they get paid for the sale, whether the horse is purchased by a dealer or the owner who wants it back. But the volunteer organizations must do all the work and solve all the logistics when the contact person is located: Who puts up the quick money to purchase the horse? How is that person or entity assured reimbursement? Where can the horse be housed and who will care for it until the owner takes possession? Who will transport it? Jacques hopes that by 2020, all the necessary pieces—the requirement for all U.S. horses to be microchipped, compliance, supporting technology, and logistics—will be in place to facilitate the passage of regulations that will safeguard microchipped horses from slaughter. This entry was posted in Horse Care, NL List and tagged Dr. Janine Jacques, dr. john wade, equine microchip lookup tool, equine protection registry, equine rescue network, equine welfare, Horse Slaughter, microchips by Denise Steffanus. Bookmark the permalink.